I made my first visit to Cornwall last autumn with some specific photo opportunities in mind; this location was one of them. 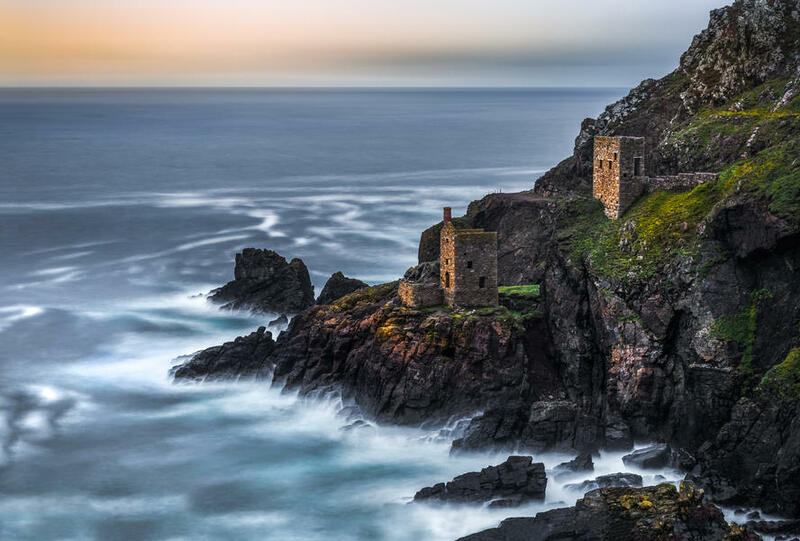 I had long wished to shoot the old mines, especially these engine houses which grip the rugged Atlantic coastline at Botallack on the North Cornish coast. While I embrace the atmosphere that inclement weather can bring to a landscape image, the continuous rainfall and, in particular, the strong winds didn’t make my task very easy. On this day there promised to be some respite in the rain, and the Photographers Ephemeris app showed that early evening would give me my best chance of low light on the engine houses. There was a fairly steep and slippery descent to the cliff face over wet grasses, so I approached with care. Considering my framing of the scene, I set my tripod up and kept it low to the ground to reduce any buffeting from the wind. This 50sec exposure was taken using a Lee 10-stop neutral density filter, otherwise known as the Big Stopper. It was a memorable experience to visit this historic site. Being late in the day the tourists had all left and the break in the weather allowed light to be cast on the stone structures. All that could be heard were waves crashing on the rocks below me. I took numerous images and while waiting for the long exposures, I had time to reflect on the hardship of the workers who risked their lives in this submarine mine. It’s workings extending half a mile out under the seabed and some 250 fathoms deep. Mining of copper and arsenic was done using chisels and gunpowder, way before mechanical drills were invented. I was pleased to capture my own classic image of these iconic structures. Living in the south-east of England, it’s really hard to find any dramatic landscapes to photograph. 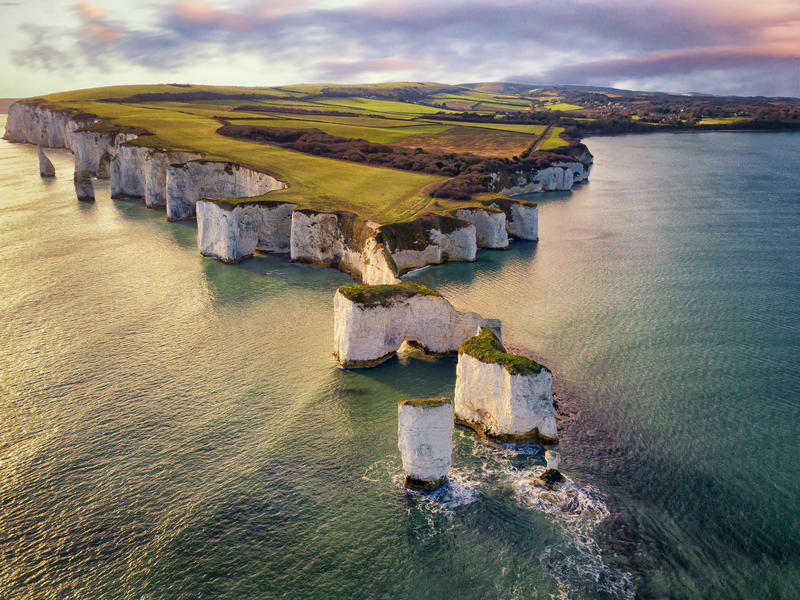 I didn’t want to waste my day off so I decided last minute to head for Dorset where my plan was to shoot three locations, one of which was Old Harry Rocks, outside of Studland, Dorset. Before I left, I checked the weather reports only to find that a storm was rolling into the location. Undeterred, I set off on my journey. Once I got there I could see that the conditions were manageable but that a storm was definitely lurking on the horizon. As I walked the mile from the carpark to the headland, I was full of optimism. Unfortunately, after scouting the location I just couldn’t find a composition I was happy with. After some moments of standing on the cliff edge in the high winds and watching the sky creep in, one phrase kept going through my mind: ‘go big or go home’. That was when I decided to risk the high winds and take some images with my drone. I flew the drone out to sea, ensuring I kept it low in order to avoid any strong gusts of wind. Once I was happy with my distance and composition, I launched the drone high into the sky. At around 300ft I took three different exposures before flying the drone back to safety. Once I got back home to my computer it was simply a matter of adjusting the colours and contrast in Lightroom. I’m definitely pleased with the composition and the subject but know that one day I’ll have to return there. Hopefully, on a calm day around sunset, I’ll get the image I really want. This image was one I’d had in my mind for a while now. Originally, I wanted to get the Milkyway directly behind the lighthouse to mimic a candle with a flame (I did eventually get this shot) but the cloud rolled in before the Milkyway had a chance to move into position. There were a few obstacles that I had to work around in order to get the shot I wanted. The most glaring problem was that I had only taken one astrophotography shot before this, so I wasn't sure if my skill level was up to the challenge. 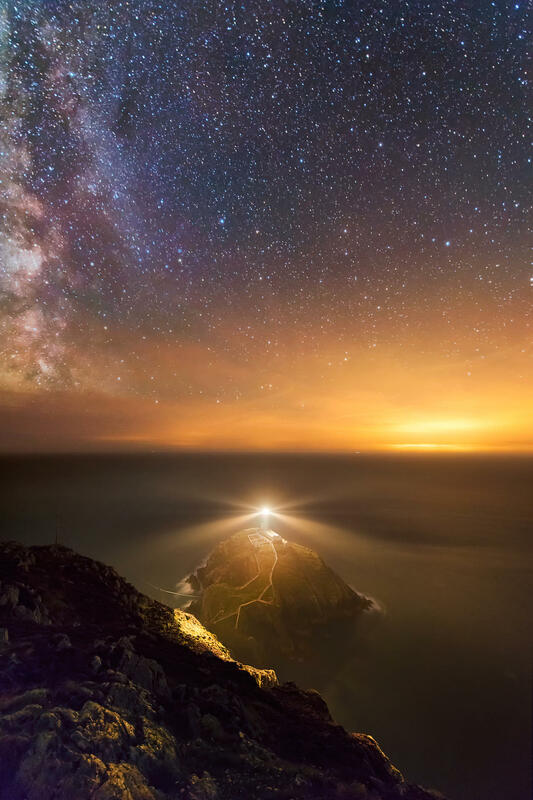 There had to be a certain amount of obscurity in the atmosphere to catch the beam from the lighthouse more prominently, but also not too much as to dull the stars. A full rotation of the beam on the lighthouse takes just 9 seconds so, with that in mind, I took 10 shots at 3secs, f/2.8 and ISO 12800. Each shot was synced to the rotation of the light and then median stacked in post-production, a method many astrophotographers use to reduce the noise of an image. Next, I shot the foreground which consists of 5 shots at 25secs, f/2.8 and ISO 3200. These shots were then stacked using the same method as the beam. I repeated this process for the sky but masked below the horizon and aligned the stars before stacking. After getting back home and editing the raw files, I actually really liked the composition. The core to the right helps to balance the light pollution from the distant lights of Dublin on the left (over 70 miles away and still such a powerful light source). I’m very happy with the way this came out and have seen that night as a huge lesson in astrophotography. Since then, I’ve worked on a lot more astro shots but still hold this one as one of my best.